There are few finer sights in angling than a specimen roach, or a net of silvers caught on a freezing cold day. 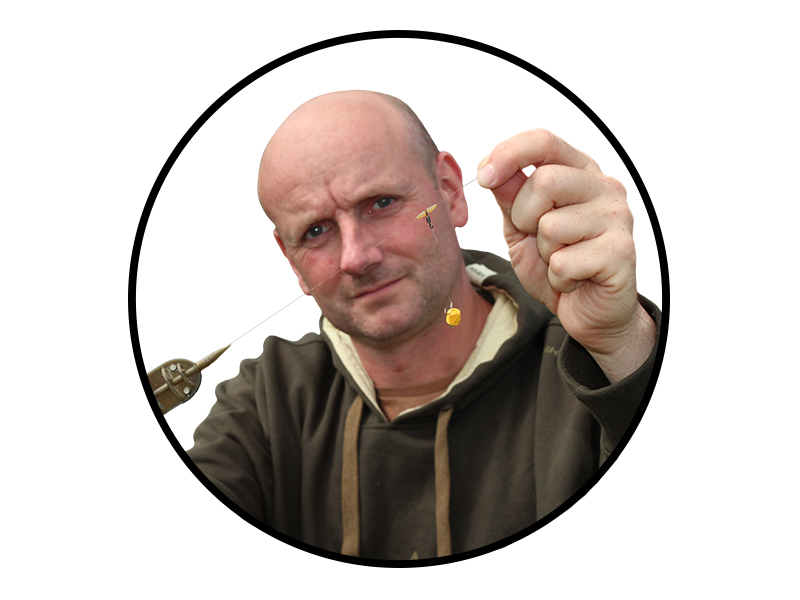 To help you have a better chance of catching your best-ever roach we've asked Paul Garner about his top roach fishing bait tips. I reckon roach are making a very welcome comeback, although often they go unnoticed until caught by accident by carp, bream and barbel anglers. These accidental catches, though, hint at the fact that rather than being the delicate feeders that we once believed, roach are in fact catchable on a much wider range of baits and tactics. Choosing the right tactic is key, and it’s surprising how roach in various venues can behave very differently, especially to baits. Follow my tips and you won’t go far wrong, wherever you may choose to fish. Roach are one species where I think it is essential to keep your maggots in top condition. The fresher and softer the bait, the more roach you will catch – it’s as simple as that. Ask your local tackle shop when they get their maggot deliveries and try to buy yours soon after they arrive. I then riddle off any sawdust and replace it with maize flour, which softens their skins and gives you the best bait possible. On venues that contain a lot of roach, including some big ones, the easiest way to sort out the specimens is to use a larger bait. 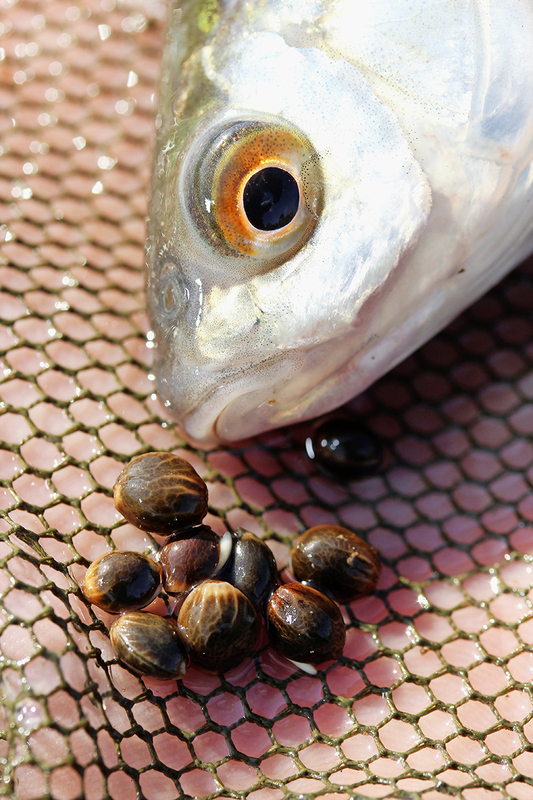 A 2lb roach can easily handle a lobworm, double sweetcorn or a 10mm boilie. You won’t get many bites, but when you do it will definitely be worth the wait! Gravel pit and reservoir roach fishing often means fishing with maggots at ranges well beyond floatfishing distance. One rig stands above all others for this type of fishing – the helicopter rig, incorporating a Kamasan Black Cap feeder and a 4ins hooklength, baited with maggots. Remember to clip-up the line so that you are fishing to exactly the same distance on every cast, and re-bait every 20 minutes in order to build up a tight patch of free offerings on the lakebed. On commercial and carp fisheries roach see an awful lot of pellets in one form or another, and are not slow to latch on to this nutritious food source. I have had some lovely roach sessions fishing with expander pellets under a fine pole float fished in the margins on venues like this. Expect to miss plenty of bites, though, as this is very similar to hemp fishing. My advice is to use the softest pellets that you can, as the roach will hang on to these for a fraction of a second longer. The Method has dominated fishing for many species, and it has transformed big roach fishing too. At Lochnaw, in Scotland, this tactic sorted out the specimens – I used a combination of crushed hemp and Dynamite Baits’ roach mix on the feeder to land fish to over 2lb. This old dace fishing trick can be just as useful when you’re after roach. If you are missing bites when fishing a single maggot, try hooking a maggot through the middle instead of the end. This will often see your catch rate soar. 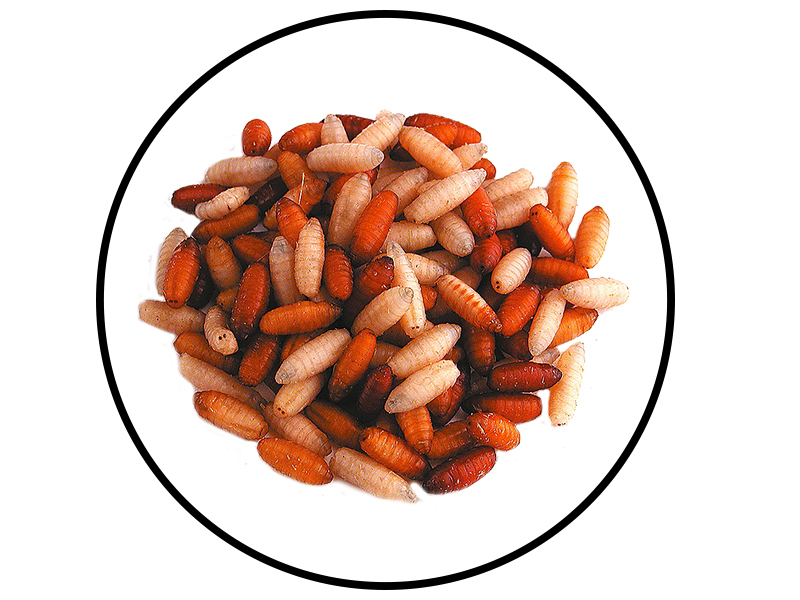 Many companies produce a dedicated roach groundbait, often loaded with crushed hemp, brown crumb and even rock salt, plus a host of herbs and spices. I often like to mix them with some fishmeal-based groundbait too, as there is no doubt that roach love the combination. A 50-50 mix is a good starting point, with four tangerine-sized balls introduced at the start of a session to kick-start the swim. Roach in rivers and lakes are almost like two completely different species. Stillwater roach can be incredibly picky, whereas their river cousins will eat a far wider range of baits with gusto. Take bread, for example. For river roaching a piece of flake and a feeder filled with liquidised crumb is often my opening gambit. Try the same tactics on stillwaters and you are likely to wait a very long time for a bite. Turmeric not only gives maggots a curry-like smell, but darkens their skins to a bronze colour. Why roach like this flavour so much I don’t know, but a teaspoonful added to each pint of maggots can definitely give your bait a boost, especially when the water is very cold. You can buy this excellent additive in your local supermarket. Having filmed roach ‘feeding’ on hemp I am sure that they spit most of it out because of the hard shell. The same grain may be picked up by several fish before finally being eaten. This behaviour, I am sure, explains why bites when hemp fishing can be very fast and difficult to hit. You can’t get away from the fact that roach love the taste of hemp, though, and so it is a must in all of my roach fishing. During the cold winter months there is no better bait to use than bread, its flexibility in the way that it can be prepared and used makes it an essential bait to take on the bank with you this winter. We've asked our regular bait expert Dr Paul Garner to show us his top 3 ways of using bread while fishing. In fast-flowing or deep rivers your feed can get washed a long way downstream, taking the chub with it rather than pulling them upstream towards you. Bread alone will work in water up to 4ft deep, as long as the flow isn’t too strong. Beyond this I will use brown crumb to stiffen the feed so I can form it into soft, fast-sinking balls. 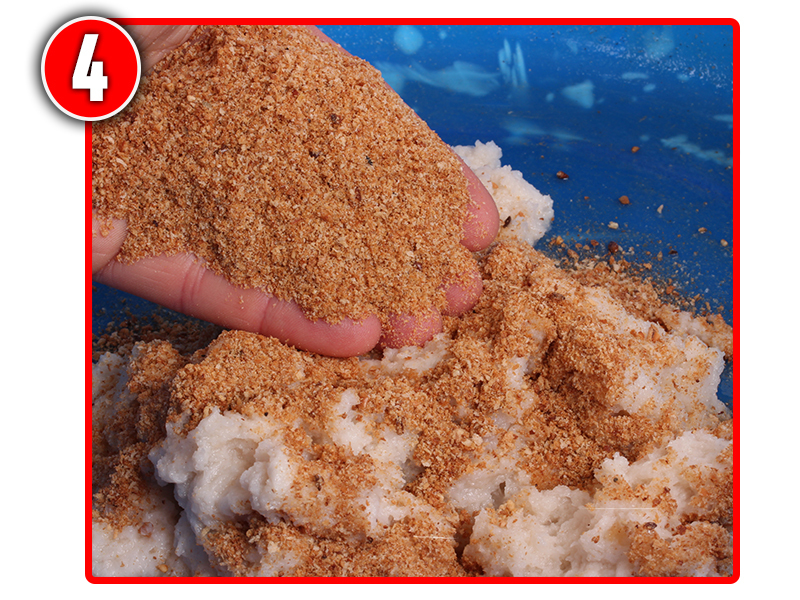 A cloudier mix that breaks up well can be made by handfuls of instant dried potato, such as Smash, to the mix. When I get to the bank I cover a broken-up loaf or two with river water, leave it for 10 minutes, then squeeze it in an sieve or carp sack that holds back the fine particles but lets the water pass through. Bread can be quite tricky to use for the first time. 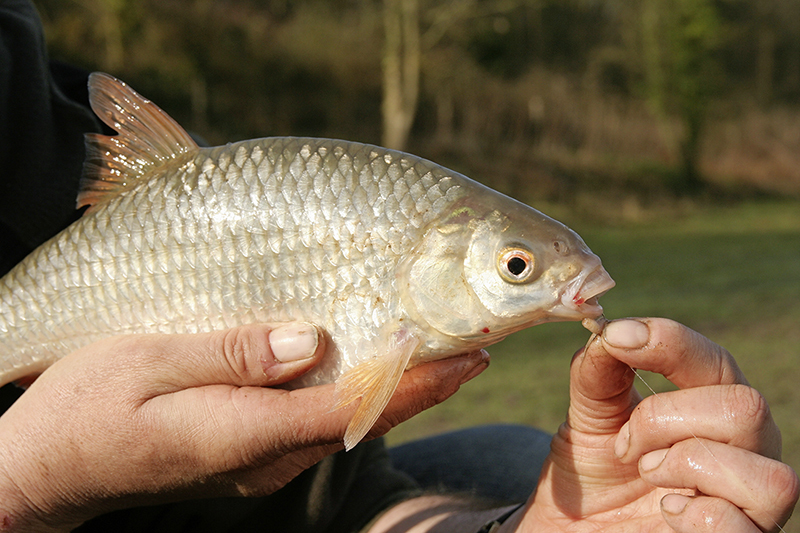 Stick with it, though – as a cheap and effective chub bait it really does take some beating. Tear the bread into small chunks and soak in river water. You can use neat bread for shallow swims, where it will reach bottom. Allow the crumb a few minutes to soak up the excess water. For deeper or fast water add brown crumb to stiffen the bread. The finished feed holds together and only breaks up on the bottom. You can mould flake around the hook shank for chub. Their cavernous mouths will easily handle a 50p-sized piece. 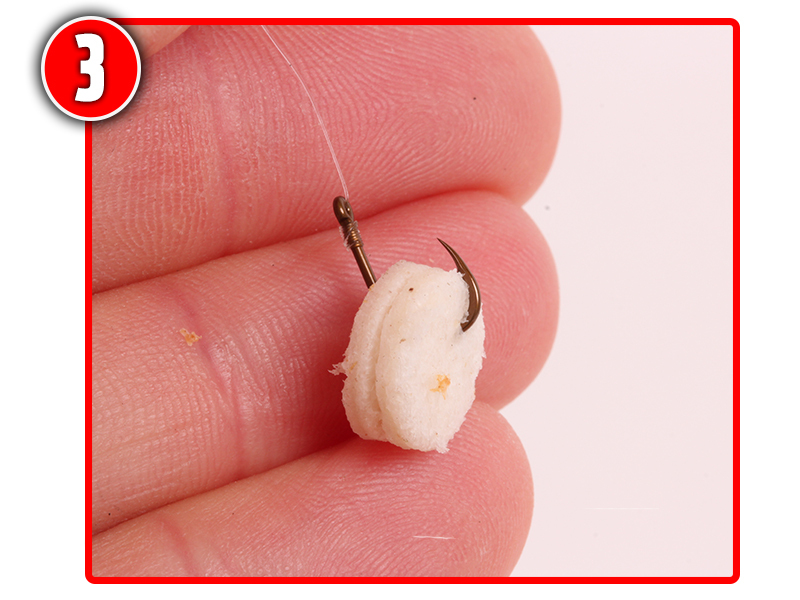 Match hook size to the bait – for big baits a size 8 is about right, for large punch go down to a 12. I feel that a large piece of punched bread is much more effective than flake. Because the punch evenly compresses the bread it tends to stay on well, even when just nicked on to the hook. Flake, pinched around the hook shank, can stay on better, but at the expense of producing a soft, neutrally-buoyant bait. Traditional bread punches tend to be a bit small for this job. I use 10mm punches, and will often cram to or three pieces of bread on to a size 10 hook to give a more substantial bait. Larger bread punches are best for chub fishing – or make your own. 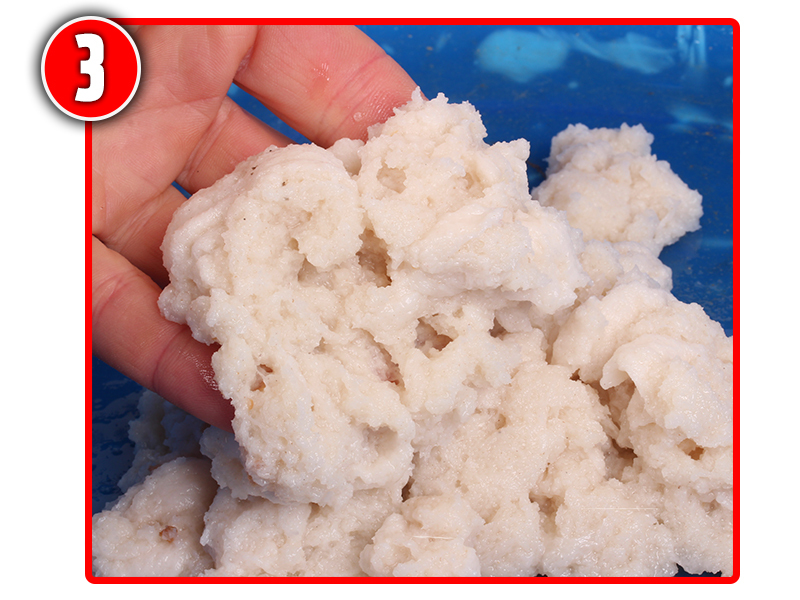 Double or triple-punch the bread to build up the thickness of the bait. ...but in water they quickly expand and cover much of it. Sliced bread can be made a lot more user-friendly by wetting and compressing it the day before you go fishing. This produces a much denser bait that holds together. First, remove the crusts from a few slices of thick white bread then soak them for a minute in cold water. 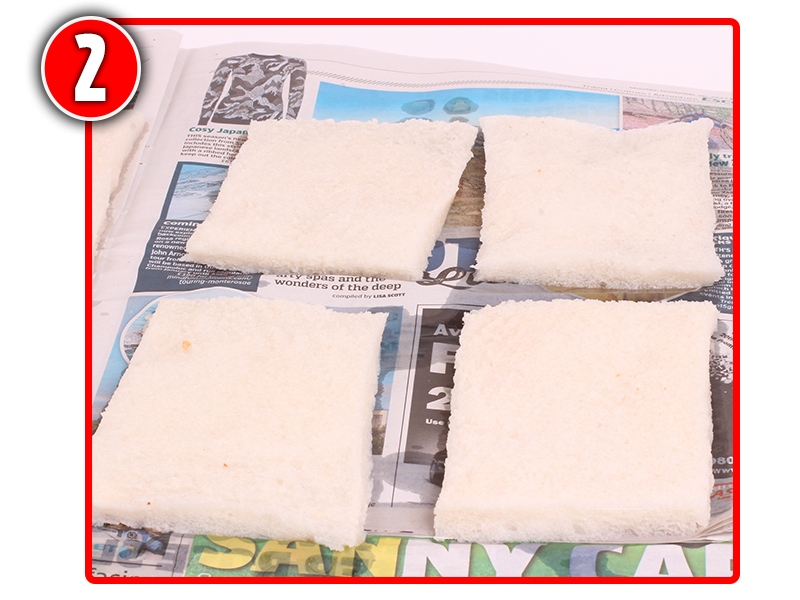 Remove the slices of bread and place them on a board covered with a couple of pieces of newspaper. Add more newspaper on top, along with another heavy board to compress the slices. Leave overnight and by morning you’ll have slim slices of damp bread that make perfect hookbaits. Remove crusts and place each slice in a tub of water for a few seconds. 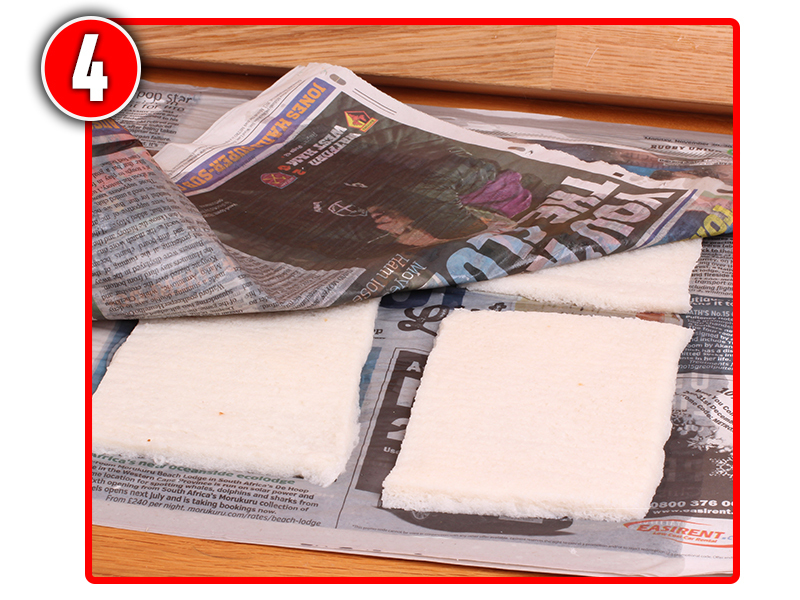 Cover with more newspaper and lay a piece of board over the top. The bread should be compressed and damp to the touch. 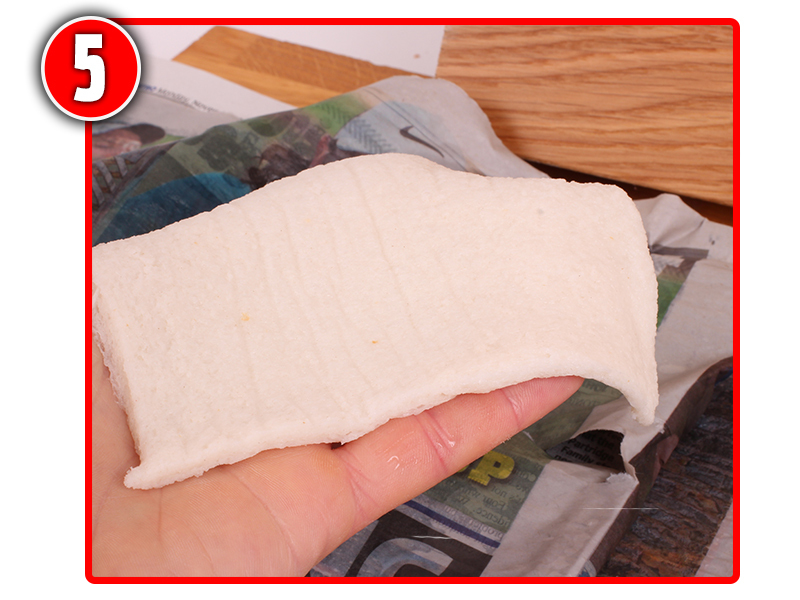 Lay the wetted slices of bread on a few sheets of newspaper. After a few hours, remove the board and unwrap the slices. The bread is tougher than normal flake and can be torn into pieces. Like most anglers I love fishing for roach, and while other species may grab my attention throughout the year, my season wouldn’t be complete without a campaign for these amazing fish. We often take roach for granted, given that they can be found in almost every river, lake or canal, but this disguises the fact that they are superbly adapted to such a wide range of different environments. One of the factors that enables roach to be so successful is their ability to eat a wide range of different natural foods. If you look at the mouth of a roach it isn’t specialised, which hints that roach are the all-rounders of the coarse fish world. Roach are equally adept at feeding on small snails as they are bloodworm. Emerging insects will get them to rise in the water column to feed, whereas an abundance of caddis larvae may seem them feeding on the bottom. Roach will even chomp mouthfuls of algae from the surface of water plants and stones, even though they can only digest the tiny animals that are hidden within. It should be no surprise that roach will feed on a wide range of different baits too, but choosing the right one for each situation can make all the difference to your catches. By thinking about how the roach are behaving in each season we can see why our tactics need to change throughout the year. This year I am expecting some great river roach sport, thanks to the regular rain giving running waters a welcome tinge of colour. This definitely improves roach sport, which reaches a climax as the light-level falls in the evening. Seed fishing with hemp and tares is what autumn evenings were made for, although a handful of casters for hookbaits will see bites often easier to hit and can bring a bigger stamp of fish. Other alternatives to try at this time of the year are stewed wheat and groats, both very cheap to buy and easy to prepare, along with elderberries that make a useful hookbait. Feeding little-and-often is the key with all of these baits. A pinch of seeds every minute will get the roach competing. If you are impatient, try starting with a maggot on the hook, as it can take a while for the roach to feed confidently on seeds. At this time of the year the roach are often feeding on tiny black water snails, which I am sure explains the effectiveness of these dark baits. The depths of winter are my favourite time to fish for roach because they can be relied to feed in conditions that most would regard as hopeless. In fact, really cold weather can be the best time to target specimen roach because, for some reason, the small fish will go off the feed, but the specimens will still take a bait, especially in the first hour of darkness. With small fish out of the equation, this is the time of year to use maggots both as feed and on the hook. I like to carry a mixture of white and red grubs, normally flavoured with pineapple, and use a combination of the two colours on the hook. For river fishing you may find that dace and chublets make maggot fishing tricky. If this is the case then switching to bread can be more selective. Rather than use flake, as many roach anglers advise, I tend to use an 8mm punch of bread instead, finding the smaller offering more acceptable in the cold. Feed a mixture of fine punch crumb and liquidised bread that has been dampened down enough to hold together when squeezed firmly. With natural food at a seasonal low, roach have to use all their resourcefulness to find enough food in winter. Often they will be full of algae, which has little nutritional value, but which does hold some tiny invertebrates that they can digest. I am sure that it is the lack ofbetter quality natural food, combined with the desire to feed, that makes roach so catchable in the depths of the winter. Water temperatures tend to rise much more slowly than air temperatures, so by the time my spring tactics come to the fore, the rivers will have closed and so my roach fishing will take place on stillwaters. 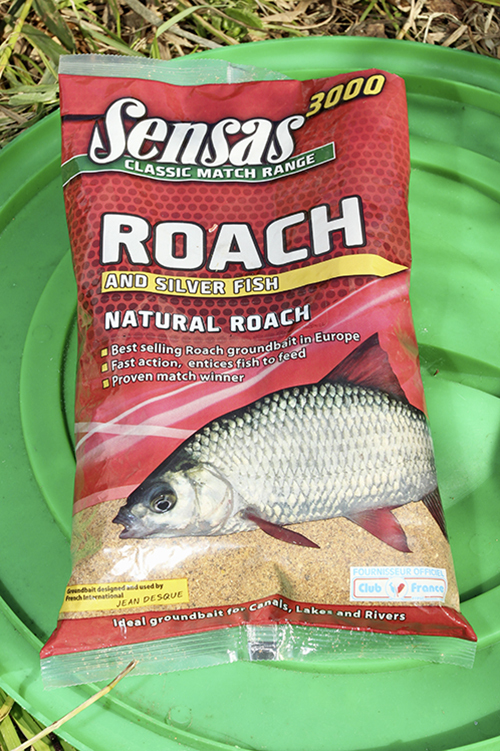 With spawning taking place around mid-May, the roach will be looking to eat well at this time of the year in order to build up their reserves. Larger baits such as worm and caster can be the roach angler’s best friend during this period. Try using a cocktail consisting of half a dendrobaena worm tipped with a caster on a size 14 hook. Evening fly hatches will see roach shoals coming up in the water and often topping on the surface at dusk. Try fishing two casters on the hook, which is a slow-sinking hookbait, and feed pinches of caster over the top to attract the larger roach. Very few roach anglers bother fishing for the species during the summer, but they could be missing out. A lot of big roach are accidentally caught by carp anglers using particle baits and mini boilies so I would base my tactics around these baits. I have found sweetcorn particularly effective on rivers during summer. Try fishing the first couple of hours into darkness with a light scattering of grains and some hemp. This has worked particularly well for me. Mini boilies are probably the most selective big-roach bait there is. I stick to 10mm baits, given the relatively small mouth of even a two-pounder. If you are after a river roach this weekend then you may want to try some of these when you are out on the bank. We have put together a list of the best baits to use when on the search for a monster river roach! No roach angler would ever go fishing without a pint of maggots. They work on almost every venue and can be fished shallow or on the deck, with groundbait or simply loosefed. Bronze maggots are the most popular colour on rivers. The bait that has taken some massive roach on rivers right through the winter, it works well in summer too, especially for a specimen fish. Trot a big piece of soft breadflake down the swim to give you every chance of a specimen. Seasoned anglers swear by casters for bonus big roach in match and pleasure sessions. Casters fall slowly through the water and are great for shallow swims or for picking out the better stamp of roach in a shoal. Seen primarily as a hookbait, deactivated hempseed is sold for feeding pigeons – but when cooked so the seeds just split, it makes a brilliant feed for roach too! Hemp is fiddly to hook and doesn’t always work, but on days when it does the size of roach you catch will be markedly bigger than the norm.